Who doesn't love the '80s? What's not to love? Madonna. Michael Jackson. Your kitchen, that's what. Almond appliances, oak-trimmed laminate cabinets, butcher block Formica -- how about cute wallpaper borders? They may not make you feel like dancing. If your '80s-style kitchen is long overdue for an update but you're still recovering from the Recession -- the one in the '80s -- here are some cheap home remodel ideas to bring it into the 21st century teens without saying goodbye to what's left of your savings. 1. Cabinetry. Replacing old cabinets can take one of the biggest bites out of your budget, so what are the alternatives? Paint them, reface, or buy moderately-priced replacement cabinetry. If you've never considered painting those flat, oak-trimmed laminate cabinets, it's the least expensive option of all and a simple DIY project. White cabinets are wildly popular today. Cabinet Rescue, a water-based acrylic enamel paint in an eggshell finish, is a paint created for just such a project. This bright-white, melamine laminate finish paint comes in 1-quart containers, requires no primer for most surfaces and should provide the two coats it will take to cover approximately 50 sq. ft. each. The paint may also be tinted. When it's dry, install some slender, modern handles on your cabinets in brushed nickel -- if you're planning on getting stainless steel appliances -- but if you want to get ahead of the design curve, burnished brass is up and coming for hardware. For a couple hundred dollars you have a whole new look for your old cabinets. If you have a bigger budget, replace the cabinet doors only and paint the cabinet boxes to match, or paint cabinet faces in a contrasting color -- another relatively easy DIY project for most homeowners. You can also add new hinges and matching hardware at the same time. More expensive but still a good budget option if you keep the same kitchen layout: buy ready-to-assemble cabinets that you install yourself, or unpainted wood cabinets ready to stain or paint. Even stock cabinets are a bargain compared to custom cabinetry. If you are handy, add finishing touches like crown moldings or hire a professional carpenter to provide the custom details. If you don't feel up to the task of installing cabinets, you can still save some money by demoing the old ones. You can also install shelving, another very current look, instead of wall cabinets. If you have something left over in the cabinet budget, the benefits of pull-out drawers in lower cabinets and other add-on storage organization solutions go a long way to adding functionality to your kitchen. 2. Appliances. Home buyers want to see new appliances, and younger home buyers want an energy-efficient home, according to Realtor.com. Beyond being hopelessly out of style, your almond appliances from the '80s can be terrible energy hogs. Even if you have no plans to sell your home in the near future, replace them. Look for models that display an ENERGY STAR rating for energy consumption. They can save you more money over time. Bargain for a better deal on scratch-and-dent or floor models, even at major retail stores. Buy when there are holiday sales and semi-annual clearance events. Take advantage of free shipping offers. Compare prices and features online. While stainless steel is certainly desirable and won't be going out of style overnight, only 17 percent of home buyers surveyed by Realtor.com in 2014 thought it was "very important." Choosing white appliances may save you money, while buying one of the "slate" finishes recently introduced by some manufacturers such as GE with their Monogram series might put you ahead of the expected trend away from stainless steel in the coming years. 3. Countertops. If you've never been able to indulge your fantasy of having a kitchen with granite countertops, the good news is that they have come down in price. 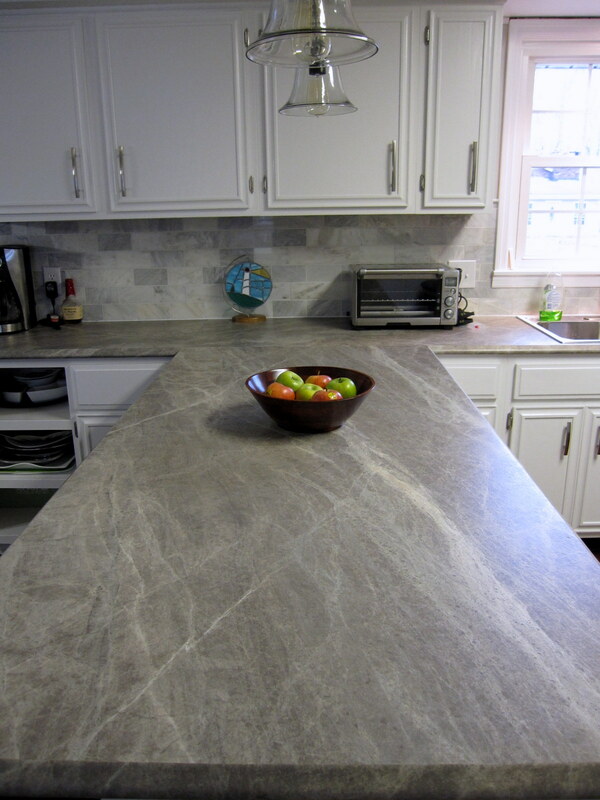 Like stainless steel, granite is likely to be with us for a while because it's been installed in so many homes across the U.S. Quartz composites that can mimic granite have gained greatly in popularity over the past few years and they are relatively maintenance-free as well as comparable to or lower-priced than granite. If you haven't updated your kitchen in 30 years, however, you've waited long enough that the countertops that have been "out" for more than 20 years are "in" again. Laminate, that perennial favorite from the '50s through the '80s and even into the '90s is back. Durable and virtually maintenance-free, at $20-$50 per sq. ft. it's also by far the least expensive material and the perfect counter for DIYers to install. Patterns and styles range from retro to contemporary designs and elegant faux stone with ogee edges for style-conscious homeowners on a budget. Don't knock it until you've seen the latest laminate offerings in person. For those who still want to stay lost in the '80s, keep the DeLorean but please bring your kitchen current. Remove the wallpaper border, put up a subway tile backsplash and replace the fluorescent dome with pendants to bring your home back to the future.